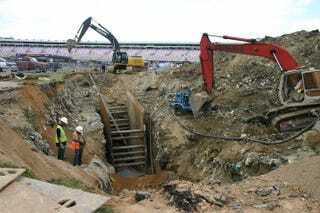 A massive sinkhole at Charlotte Motor Speedway has swallowed up a large chunk of the infield. Speedway representatives say the sinkhole was likely caused by a combination of heavy rain and the track being built atop a landfill. The Charlotte Motor Speedway is one of the major tracks on the NASCAR circuit and home to, among other races, the upcoming Bank of America 500 this weekend. The event draws 100,000 fans, but the facility's going to have to hurry to fill a massive sinkhole that opened up in the middle of the infield near the backstretch of the track last Friday. The cause, according to the management of the track, is a drain pipe that was a part of the landfill the racetrack was built on top of. The pipe itself is more than 30 years old and had slowly deteriorated to the point that it finally collapsed after heavy rainfall soaked the area. "We are replacing the old pipe, backfilling the dirt, and packing it down," said a CMS spokesperson. Click to viewPhotos from WCNC show the hole is more than 35 feet deep and about 75 feet long, which is large enough to support the digging equipment they've had to lower into the hole to start the work. According to the CMS Facebook page, the track will be open in time for the race. You may have heard about the sinkhole that developed in one of our infield display areas last Friday night due to recent heavy rains. The area was over a landfill and we found a 30 year old drain pipe that had deteriorated more than 35 feet below the ground surface. We are replacing the old pipe, backfilling the dirt and packing it down. No worries racing fans - it will be completed in time before Bank of America 500 week! When this is complete, NASCAR fans will go back to happily camping on top of a deteriorating landfill.